As U.S. and Canadian Manufacturing companies felt the sting of comparable products being marketed at a fraction of the pricing required for their very existence they recognized the need to produce products at substantially less cost. This began the migration of manufacturing companies to countries where production costs met their needs. This was the beginning of moving manufacturing to Mexico from the U.S. dating back 40-50 years. The question is just what are the benefits for companies moving manufacturing to Mexico? ACCESS TO PROFESSIONAL SERVICES: Every CEO considering Mexico as an alternative is faced with series of complex issues such as customs compliance, Mexican regulations on corporate accounting, Mexican tax issues, environmental laws, governmental requirements on employers, etc. Mexico is a different culture and has laws and regulations different from the U.S. and Canada as well as having a different culture of values. When companies consider Mexico, they have a choice of ‘going it alone’ or ‘engaging a professional Mexico Shelter Service’. A qualified and proven Mexico Shelter Service company will make the move no more complicated than moving a facility from one side of town to the other as it handles these complexities. REDUCED OPERATIONAL COSTS: Elements that affect operational costs, and business profitability, are found to be more attractive in Mexico. The savings can be found in lower lease or purchase costs of industrial space by example. Studies support that companies in the U.S. may benefit from a reduction of 11-12% in tax rates simply by moving manufacturing to Mexico. LABOR COST SAVINGS: Mexico offers an increasingly educated pool of labor at costs substantially less than the U.S., Canada, Asia and Europe. By example, labor costs in Mexico are 54% lower than labor costs in Poland and 88% lower than Canadian labor costs. When compared to the U.S. studies support labor savings of 50 to 70% or more depending on areas to which the comparison is made. FOCUS ON INDUSTRIAL EDUCATION: The Mexican government, Mexican-owned businesses and major companies foreign to Mexico have established technical training centers and colleges for trades such as electricians, welders, computer programming, plastic injection molding, engineering, construction, etc. The focus is on creating a population with high levels of education that can meet market demand as companies explore the benefits of doing business in Mexico. OPERATIONAL SIMPLIFICATION: Mexico has streamlined the processes for obtaining permits, licensing and governmental approvals. Comparing Mexico to India, Asia, Brazil, and Indonesia we find that Mexico is a much simpler host for foreign investments and business operations. With only thirteen processing days and a reduced eight procedures, Mexico is the location of choice for companies seeking operational simplification. 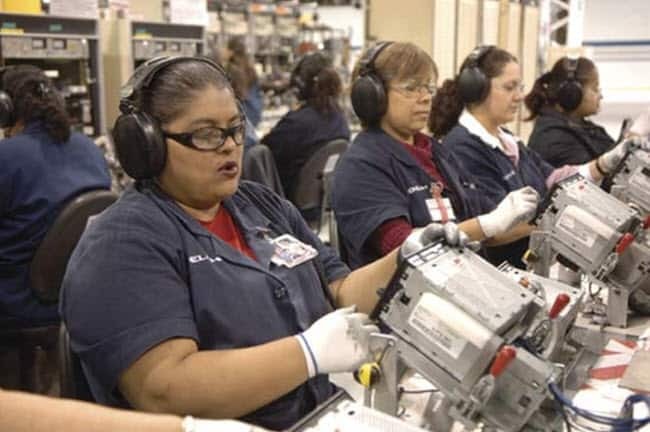 EXPANDED MARKETS: Companies moving manufacturing to Mexico discover that there is a large consumer market for sales and distribution of their products directly into Mexico. A growing population of 1.6 million with over 1 million in their productive years, provides a significant market where the countries GDG (Gross Domestic Production) now exceeds $26 million (USD). ACCESS TO 45 COUNTRIES-DUTY FREE: Mexico has more duty-free trade agreements than any other country in the Americas. With 11 free trade agreements that include 46 countries with which products can be imported and exported duty-free demonstrates the Mexican government’s focus on free trade. This benefits all manufacturing companies that wish to establish manufacturing in Mexico where products are exported duty-free with the Peso being the exchange currency. Again, simplification is demonstrated when a comparison is made to the U.S. and other countries where Mexico requires only five documents in its exporting and importing procedures. RIPPA – (Reciprocal Promotion and Protection of Investments Act): This act passed by the Mexican Government provides assurances to foreign companies that their patents and trade secrets are protected against theft and false branding. Theft of company trade secrets, patent infringements and technology is a major concern of companies considering setting up off-shore manufacturing. Controversies of such thefts and technology duplication have existed since U.S. companies ventured into Asia, China, and South America over the past 40-50 years. Mexico has been sensitive to this concern and passed RIPPA to provide protections needed. BENEFITS OF NEARSHORING: Little needs to be said about the benefits of manufacturing just south of the U.S.-Mexico Border. Shipping and supply chain management is simplified at lower costs in comparison to Asia, Europe, India or other areas involved in international commerce. With over 16,000 miles of railroad coverage flowing north from Guatemala to the U.S., 59 international airports, 16 deep water ports and 176,000 miles of highways transportation to and from Mexico is simple and low cost. To serve the U.S. Market Mexico shares 52 access points through which over 4 million vehicles loads and over 70 million automobiles transit yearly. Executive costs, including transportation, hotels, and meals but more importantly, loss of productivity time, is one of the most significant advantages of locating manufacturing in Mexico. The Tecma Group of Companies has been successfully assisting companies with moving manufacturing to Mexico for over thirty-one years. After assisting nearly 1,000 such companies with successful operations in Mexico the process is highly developed and simplified for its clients. Request Your Free Savings Estimate!